This essay is about Brita water filters. I give them a mixed review. The use of water filters is a great idea. They efficiently create large quantities of clean, good-tasting water. Using bottled water is idiotic. It wastes energy creating bottles, bottling and transporting. It clogs land fills with empty bottles. It is ridiculously expensive. It is just filtered city tap water. Don’t be fooled by the names that suggest glaciers, mountain spring and artesian wells. Unlike tap water, there are no inspections of bottled water plants. That is just the beginning of the problems with bottled water. More dirt. On a per litre basis, they are quite economic. The chilled, filtered water is delicious. I have tasted water from other much more expensive filtration systems. Brita tastes much much better. You start with inspected tap water. At least you know it has no bacterial contaminants. If your water has few particulates in it, the filter lasts much longer than advertised. If you have well water, it will have particles that clog the filter in about a month. The filter looks symmetrical, but it is not. You have to rotate it through four possible positions to find the one that fits. I can’t see any reason to do this other than irritate people. It is perhaps too late for them to use a symmetrical geometry, but they could add matching indicator arrows on filter and jug so you can get the orientation right on the first try. The filters constantly leak little flecks of carbon. Most of this gets into the pre-filtered water container. It is not harmful, just disconcerting. They need to put some sort of screen on the inside top of the filter to keep these flecks in. The containers were designed by a blithering idiot. There is nothing that holds the lid on. It keeps falling off. The original model and the slimline versions were fine, but they have been discontinued. You have to be careful to hold the lid on at all times. Canada Tire periodically advertises them at half price. When you get to the store, they always have some flimsy excuse why you can’t actually buy them at half price. 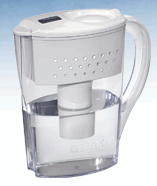 Brita should not be selling through such a dishonest retailer. The upper water container is opaque. This causes trouble with the following scenario. A fills the pitcher and puts it back in the fridge. A few minutes later, B uses the pitcher to get a glass of water. Because the top chamber is still full, when the pitcher is tipped, water floods out all over the counter. B can’t tell that the water has not yet flowed into the bottom container. Let the tap run until the water is cold before filling the pitcher. The filter is not designed to get rid of the metallic taste of the early tap water. Keep a second pitcher on the counter for filling the kettle. As well as making the water taste better, it helps keep the kettle clean. There is no need to keep the water cold or to take up room in the fridge. When filling the pitcher, make sure you don’t get water down the spout, bypassing the filter. When you use some water, top up the pitcher right away. That way you will always have clean cold water without waiting.